ASUS ZenScreen MB16AC 15.6-Inch Full HD IPS Monitor is available on Amazon, B&H, and Newegg. This is not a paid promotion. This monitor was purchased bought online and used regularly for 6 weeks prior to publishing this article. My previous job had me working mostly from home for the prior 6 years, so I quickly discovered just how badly I missed my home office's multi-monitor SuperServer workstation/datacenter whenever I was out and about. I'm a productivity worker, mostly working by day, and blogging by night. Much of my computer time is spent on web research, email, content creation, and of course, leading and attending WebEx and Skype for Business meetings. Whether I'm home or not, I need to get these things done, effectively and easily, without annoyance. Think about it. Sharing out your primary desktop, right along with your PowerPoint speaker notes, isn't exactly ideal. Sure you can go full-screen on your slide deck, but what about the speaker notes that you now can't see? How about the chats going on with your coworkers, privately? Oh so much better with a secondary display, especially when doing live demos, or helping out with Proof-of-Concepts that may require hours of collaboration from your hotel room. Those first few weeks on the new job I shopped for lightweight travel monitors that used USB-C, and were IPS displays at 1920x1080 minimum. This meant I could have both my laptop's 4K display and my secondary display in 1920x1080 resolution when on the road, at 100% scaling. Such a configuration is essential for screenshots and frequent RDP sessions, where pixel-perfect accuracy is required. Despite improvements to Windows 10 scaling, blogging really requires no scaling at all for the screenshots to look normal, and to avoid 4K pixels pumped over RDP with minimal benefits and mostly annoyance. Not to mention those customer facing meetings, where you're lucky if the projector can get to 1280x1024. Sure helps when that is your secondary display! Finally, I run VMs. A lot. And a lot of them. Being able to juggle multiple UIs from vSphere, VMware Workstation, and an encrypted VPN session to my home lab is a must. 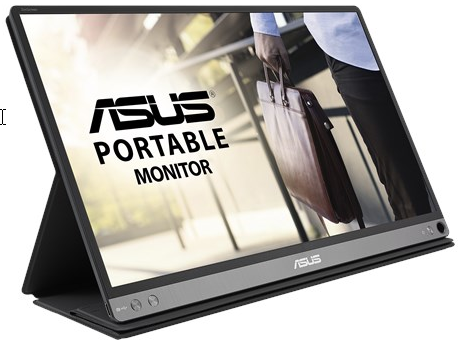 Back in March 2017, the only monitor available that fit my requirements was the ASUS MB169C+ 15.6" Full HD 1920x1080 IPS USB Type-C Powered Eye Care Portable Monitor, still available at Amazon, but only from a variety of third-party sellers. 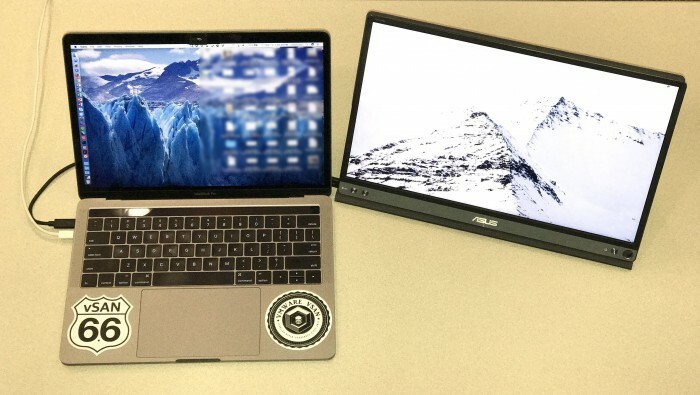 Honestly, I had hoped for one made by Dell, HP, or Lenovo, but I soon fell for the brushed metal look and thin design of the ASUS. 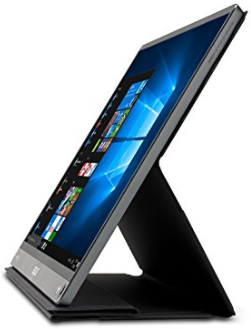 While it was quite practical, it was also imperfect, with a wide bezel design that relied on a cover that uses noisy Velcro in conjunction with elastic band material to awkwardly configure the monitor stand. Twice for every meeting actually, when setting up, and when breaking down. It just so happens another family member could use a secondary display for his Dell XPS 15, so off to college this MB16C+ went, relegated to occasion use there, replaced by this newer model I use quite often. The folding cover is now magnetic. No more elastic straps and loud Velcro! Shop for ASUS ZenScreen MB16AC at Amazon. I purchased mine in August, and in short, it's a keeper! I quickly found this design was better suited for my frequent set-up/fold-up needs, which is often done in rushed situations at customer sites. Anything that detracted from the flow of group conversation was a drawback, but that's behind me now. Note the new very thin bezel, which cosmetically and functionally is a near perfect match for my Dell Precision 5510 laptop. I've now used it at several hotel rooms and customer conference rooms, and it's safe to say it's working out quite well. This monitor meets my on-the-go needs very nicely, these past 6 weeks of regular use in a wide variety of situations. 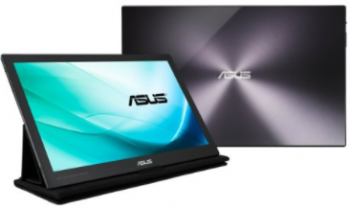 Visit the ASUS Product Page. How does this new hybrid signal solution approach actually work? ZenScreen™ MB16AC only requires a single USB connection for both power and video transmission from your host device. It features an innovative hybrid-signal solution with native support for USB Type-C™ (USB-C™) connections, and uses an installed driver to support USB Type-A connectors for full compatibility. The reversible, any-way-up USB-C design enables quick, hassle-free connection to any device. USB 3.0 Laptops - if you have an older USB 3.0 only laptop, use the provided USB-C to USB 3.0 (Type-A) connector with the provided cable, and connect to your already-logged-in laptop. I used a hand-me-down Lenovo Yoga 13 that's now running Windows 10 Creators Update to test this. As soon as I made the cable connection, the MB16AC's on-screen display said something about not finding DisplayPort compatibility, so it automatically went into a mode where it instead presents itself as a DisplayLink device. This caused Windows 10 to automatically download the DisplayLink driver. A few seconds later, the MB16AC monitor sprang to life, turning on automatically, and running at full 1920x1080 resolution, with no apparent lag. Nice! Subsequent cable insertions resulted in a nearly instant-on experience. While I'd prefer the driver-less DisplayPort experience USB-C users enjoy, it's a nice touch that the USB 3.0 experience was nearly as simple. Yep, it's simple plug-and-play for this colleague's MacBook Pro. We didn’t choose the best wallpaper choice for this secondary screen example, it's just a very white image. It looked great, and Mac OS X chose the 1920x1080 native resolution automatically. Easier to operate on screen menus for initial set-up than prior design, which for me meant pushing the power button, then cranking brightness and contrast to maximums, haven't felt the need to tinker with menus ever since. Once configured (described above), there is no need to push the power button again, it powers up automatically as soon as you attach the cable. No battery to worry about, and zero chance of accidental power-up in your luggage. Plugable Thunderbolt 3 40Gbps USB-C 18" Cable. The included USB-C cable is not very flexible, and is a bit too long. 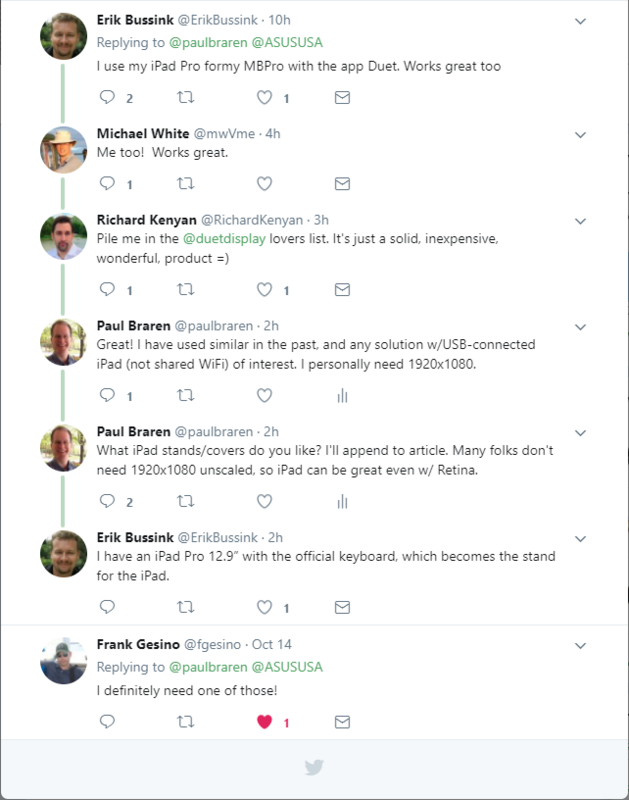 This can be easily remedied by investing about $20 in a Plugable 18" USB-C/Thunderbolt 3 cable, available at Amazon or Plugable. As seen in the video below, it's not quite as bright as the display in my high-end laptop, but that's nitpicking. In most dim hotel rooms, I lower the brightness of my laptop anyway, where the two displays look very nearly identical. It's not a touch display, resulting in slightly annoying on screen smudges on the matte glossy finish screen, from my accidental touches out of habit. You can't always use it as a podium monitor to preview what is being projected behind you when presenting, since Windows 10 still has restrictions on which types of monitors can be cloned and which can't. You may still have to look behind you at the projected image to see exactly what the audience is seeing. In a non TSA Precheck line, I did have a TSA employee ask me why I hadn't removed all my laptops. I politely explained that it's actually just a monitor with no keyboard or battery, but of course the TSA agents now needed to do a full bag inspection anyway. You may want to avoid this slowdown by treating it much as you would a laptop or iPad. Take the monitor out of your luggage and put it in a separate bin on the X-Ray belt. Here you'll see a close 4K look during my unboxing and initial testing, including a look at all on-screen menu functions, along with cover unfolding and folding. If you don't have time for the whole video, here's the spot at the end where I show just how straight forward set-up and fold-up really is. 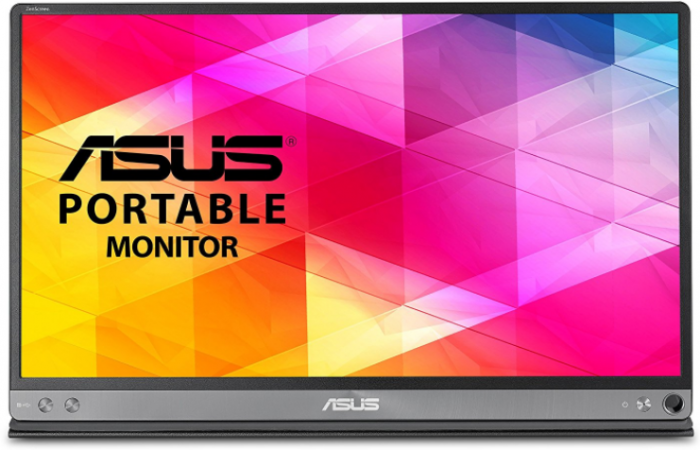 ASUS ZenScreen MB16AC 15.6-Inch Full HD IPS Monitor on Amazon, B&H, and Newegg.